Bhanu Hajratwala’s treasure trove of Gujarati fare was originally learnt from her family in Fiji and then taken with her to the US after her marriage. There she began improvising on traditional dishes, trying to find flavours that would replicate the original ones when the original ingredients were not readily available. Recipes have certainly been simplified but after reading the book I begin to appreciate the awe inspiring complexity of dishes like Oondhiyu, which was originally cooked upside down in hot coals and which is fast vanishing except from specially catered do’s. Bhanu Hajratwala illustrates her steps with careful line drawings to make sure that complicated recipes are explained accurately and simply. And coloured photographs highlight the look of the finished dishes. Hajratwala begins the book by offering several simple ways of preparing the dry and fresh spice blends used in the recipes, talks about the kind of measures and ensures that anyone unfamiliar with Gujarati food is well prepared to tackle the recipes. It would be best to warn the calorie conscious that the Gujaratis use a lot of oil in their dishes which is why they taste so succulent. Though deep frying is just one of the techniques used. Steaming and gentle heating is often used to make light, fluffy, sweet and sour dishes. Gujarati food uses a lot of jaggery, which is why the curries have a subtle sweetness about them that sets the cuisine apart from spicy South Indian or Mughlai fare. They also use varying kinds of food grains, such as bajra, jowar and atta in the peasant flatbread or rotla or combine ingredients such as potatoes, eggplant, yam, or raw bananas simmered in a garlic-based sauce which, even if you are cooking in a Bengali kitchen would require a well prepared trip to the local market. A dish like the sev-tamatu nu shaak combines ripe juicy tomatoes in a curry topped with chickpea fritters. The cuisine itself consists of a combination of Jain and Vaishanava influences which accounts for its great variety, as well as for its intricacy. 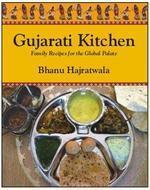 Hajratwala unveils the secrets of various grandmothers’ kitchens for aspiring cooks. The book is a challenge in creativity because snacks like khandvi and handvo are difficult even for native Gujarati cooks. However Hajratwala is to be commended for making the cuisine available to cooks from many parts of the world. No Comments on "The Intricacies of a Subtle Cuisine"